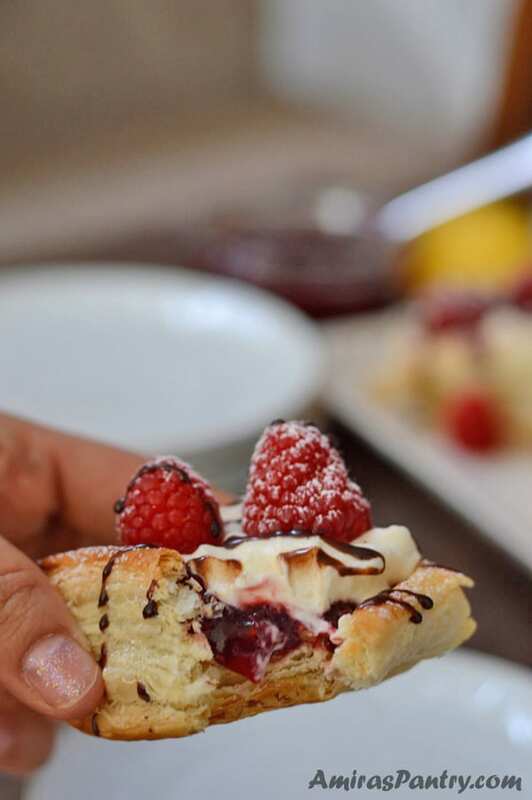 Buttery, flaky and creamy raspberry pastry, that is ridiculously easy and totally irresistible. A delicious, everyday dessert tart/danish recipe. 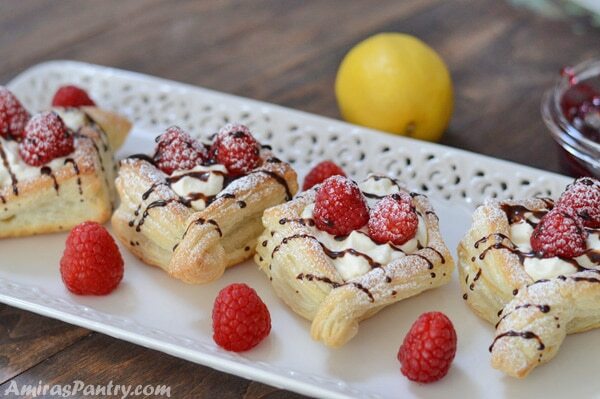 Lemon cream puffs filled with raspberry preserve and topped with fresh raspberries. Raspberries and lemon desserts are my favorite. The sweetness of the raspberry preserve goes very well with the tartness of this fluffy lemon cream. This is a dessert for serious, lazy dessert eaters :). 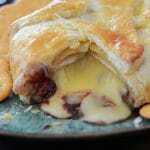 While I was writing the last recipe about the deli stuffed Egyptian Boreek, I remembered another famous pastry kind. Danish, it is so popular and comes next to Boreek in all bakery shops and street vendors in Egypt. Back then, danish was mostly filled with custard with a cherry on top. These days you can find all sorts of filling and garnishing. In my humble opinion nothing pairs well with lemon curd than raspberry, so I was craving something tart and sweet. Lemon curd came to mind with raspberry preserve and voila the dessert was on the table in 20 minutes. I like puff pastry as much as I like phyllo dough. It is very convenient, interesting to play with in the kitchen and always always the final product is good even if you improvised and did not follow a certain recipe. This is very good especially when you are having sudden visitors, brunch or just want a delicious dessert/breakfast for your family. I never leave my freezer without a package of both. Now let me show you how simple this is. Here I’ve used a ready made package, but as usual you are encouraged more to make your own. I promise I will make one better than my last one soon. I’ve cut my sheet into 9 equal squares. 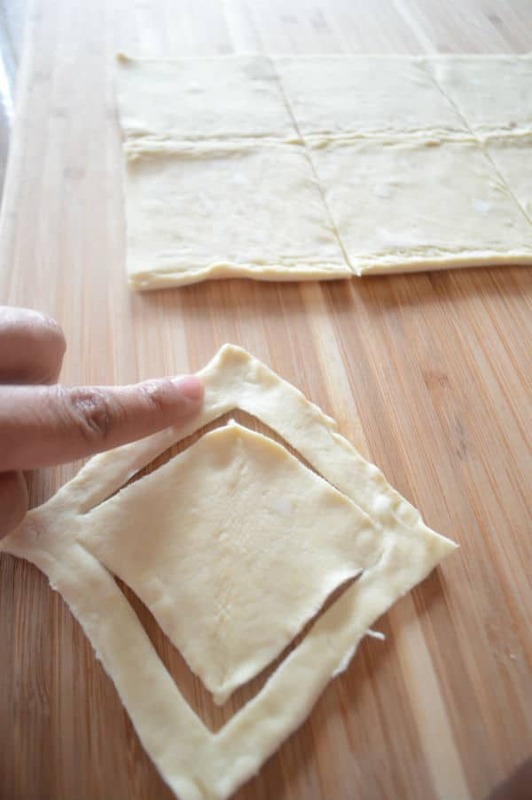 Fold the square into a triangle and do not seal . 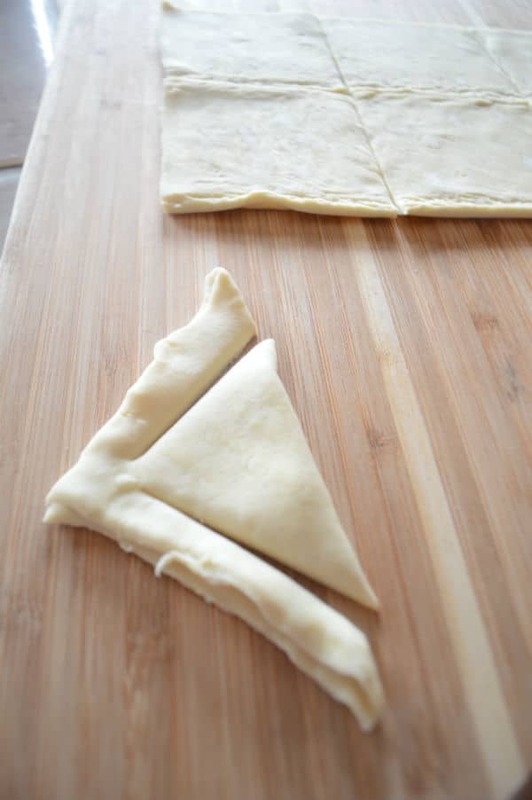 Leaving half an inch from the edges and using a sharp knife, make two cuts parallel to the sides of the triangle. Unfold, you’ll have two V shaped cuts. Fold both sides over the middle putting one under the other. I’ve brushed the edges with some water before folding to glue the edges together. Bake as directed on the package. Take them out and let them cool. Prepare the filling. I’ve prepared some whipping cream and folded the lemon curd in. It was divine. Now fill each puff diamond with a teaspoon of raspberry preserve then about a tablespoon of the lemon cream. 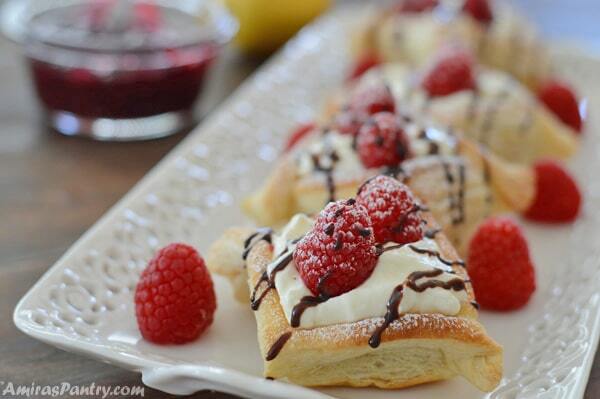 Top that with some fresh raspberries and you’ll get yourself a lovely easy delicious dessert. I left mine unassembled until it was ready to be served and almost let each member of my family decide on the amount of filling he wants. Also I’ve drizzled some dark chocolate syrup on top, then for a more dramatic and festive look :), I dusted some with confectioners sugar… seriously addicting. This is a very hard to resist kind of dessert and it will please kids and adults as well. 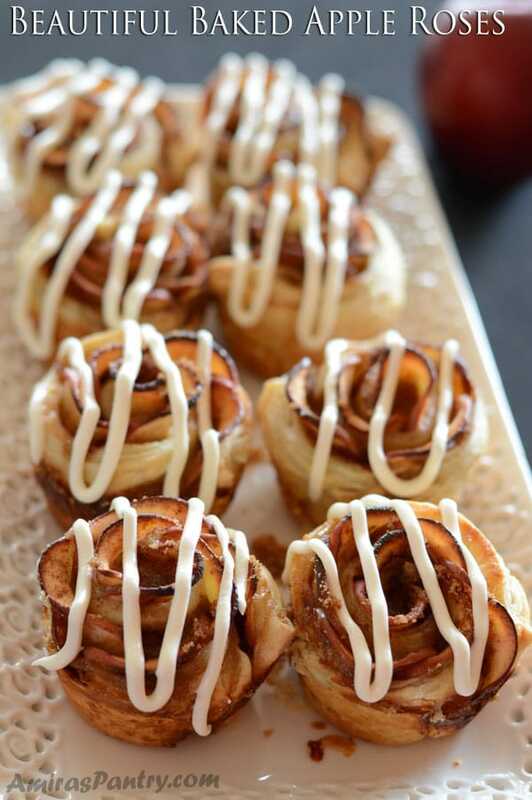 Make them for your next gathering or for your little family.. they will love them. I hope you’ve liked today’s recipe … Until next recipe have a blessed weekend and Happy Easter. 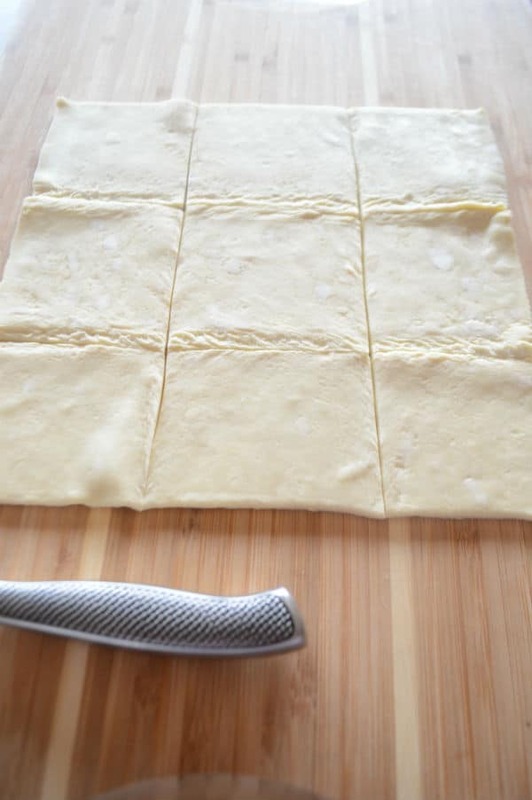 1 package of frozen puff pastry (2 sheets), thawed. Raspberry preserve , about 1 cup. 1 cup lemon curd , homemade or store bought. Chocolate syrup , confectioner’s sugar. 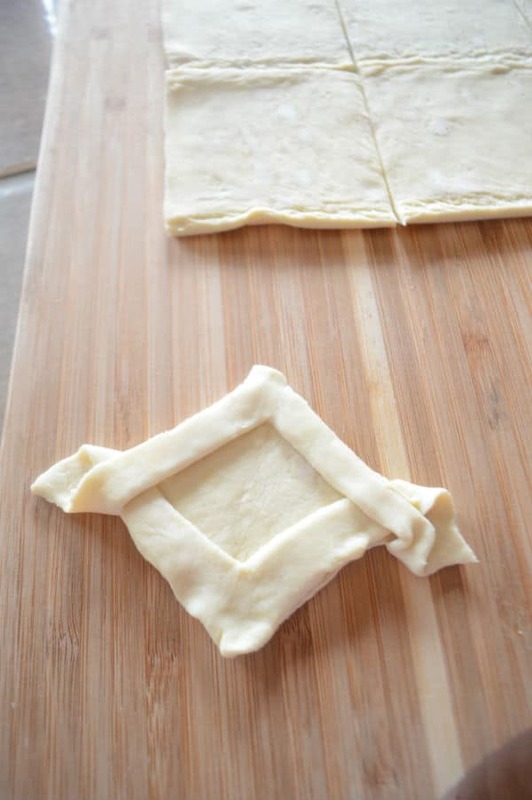 Cut each pastry sheet into 9 squares per sheet. Fold each square in half to form a triangle. Cut along each open side almost to the tip of the triangle. Unfold , dip your finger in a little water then wipe the square edges. Fold one corner to the side of the square, repeat with the other corner to the other side of the square. Place the puff diamonds on a parchment paper lined baking sheet and bake for about 15 minutes or until golden brown. 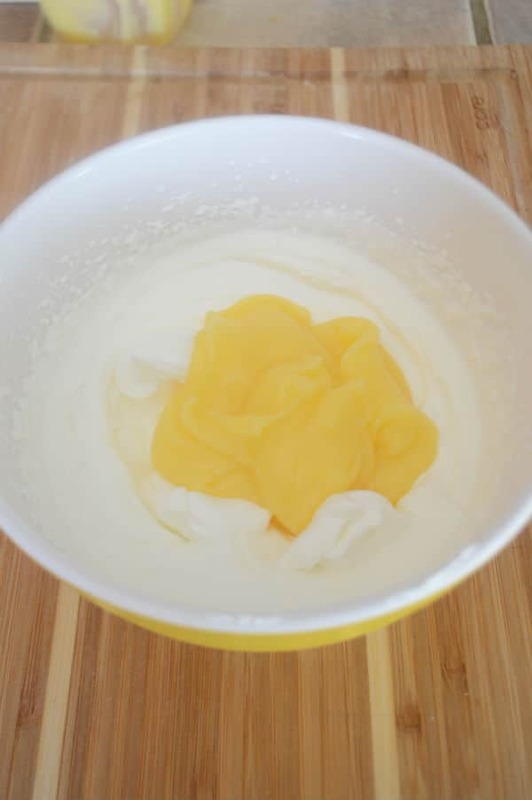 While the puffs are baking prepare the lemon filling by beating the whipped cream with vanilla extract until stiff peak forms, them fold in the lemon curd. let it cool down completely before handling. 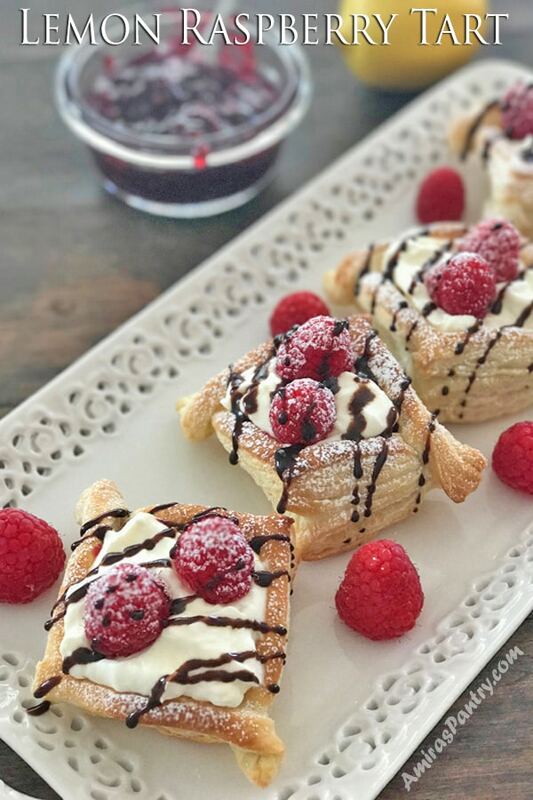 When the puff diamonds are cooled, fill with about a teaspoon of raspberry preserve, top with a Tablespoon of the lemon whipped cream. 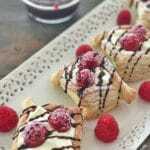 Garnish with fresh raspberries, confectioners sugar and chocolate ribbons if desired. 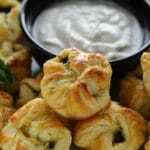 This is better enjoyed immediately after assembly, so you can bake the puff and prepare the filling before hand and assemble only when you are ready to eat. This was the easiest dessert I’ve ever made. I had all the ingredients and we enjoyed it a lot. Helen, thank you so much for trying this recipe. It is my go to dessert as well when I am pressed in time :). Happy you loved it. Made with homemade curd, also from this site and with summer berries. Omg yummmm. I agree – lemon and raspberry works perfectly together, and this dessert looks wonderful! What makes it very appealing also is that it is super easy and quick. Thanks Beth. (not so good) but it was just “miyah”… Next time I would not use whipped cream, simply; make my own lemon curd, with a dollop of whipped cream on the side and the berries. Douglass, thank you for trying this recipe out. I’ve used my homemade quick lemon curd and it turned out beautiful. Some of my readers though liked it with store bought. Definitely use a homemade lemon curd if this is your thing. 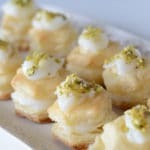 I love the shortcut using puff pastry. Such stunning and scrumptious tarts!!! Oh Amira, these little squares look so pretty, delicate and yes, very elegant…I love the lemon curd in it and so nice with fresh raspberries…thanks for the tutorial…super helpful!